Scuba Cat Diving, Phuket, Thailand, a British owned Dive Center, is a 5 Star PADI CDC Center and has been a 5 Star PADI IDC center for more than a decade. We teach all levels of PADI Scuba Diving Courses, have a dedicated boat for Scuba Diving Day Trips to the best Scuba dive sites around Phuket and Koh Phi Phi Island, Thailand. 2 liveaboards year round in the Similans, Koh Bon, Koh Tachai and Richelieu Rock and all the best Scuba Diving sites in the Andaman Sea, Phi Phi, Koh Ha and Hin Daeng. Look out for our Summer Season Course Specials. 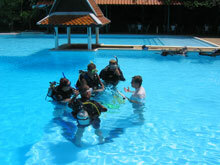 Scuba Cat Diving, PADI 5 Star CDC Centre, Phuket, Thailand has a resident PADI Course Director, Sarah Kench. Sarah teaches the whole PADI IDC and is with you throughout the PADI Instructor Exam (IE) for continuing support. Scuba Cat Diving, Phuket, is known worldwide for training quality and customer services having an excellent reputation within the diving industry for producing first class and highly employable PADI Instructors from their PADI IDC's. Scuba Cat Diving, Phuket, Thailand is the only PADI 5 Star CDC Center based on Patong Beach, this is the highest PADI Dive Center achievement possible. PADI CDC distinguishes us from the rest. Liveaboard experience can be incorporated with your PADI IDC or PADI Divemaster course. or change your life with a Scuba Diving Career Package or Internship, Scuba Cat Diving, PADI 5 * CDC Center Phuket, Thailand is the place to come for an unforgettable experience. Scuba Cat Diving, Phuket, Thailand teaches tec diving including Gas Blender, DSAT Tec Rec, Trimix, and rebreather courses up to Instructor level. 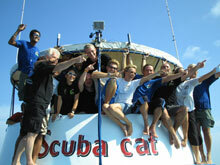 Many of these courses are onboard our own liveaboard MV Scuba Cat in the Similan Islands at no extra cost. Scuba Cat has Nitrox and Trimix diving capabilities and is the only dive center in Phuket to offer the full range of DDI Diving courses up to Instructor level. Additionally, Scuba Cat Diving has Scuba Tank filling stations to be confident of both land based and aboard our daytrip and liveaboard boats. Scuba Cat Diving, Phuket, Thailand are proud to have comprehensive diver training facilities at their 5 star PADI CDC Center and a well located Scuba diving shop on Patong Beach including 5 fully equipped classrooms catering for students of all levels and a dedicated scuba dive training swimming pool. Scuba Cat conducts all levels of Dive Courses aboard our liveaboard MV Scuba Cat during the Summer Season at no extra cost including PADI MSDT Instructor training. We pride ourselves on catering for the individual beginner Scuba Diver to the most technical diving addict with many tec dives conducted from our liveaboard boat MV Scuba Cat. 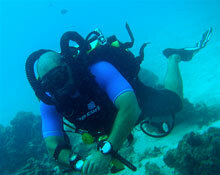 We teach all the Dive Courses, Instructor Development Courses (IDC) and other instructor courses. 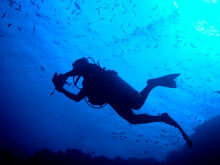 PADI is the largest scuba diving organization in the world. As a PADI Professional Scuba Diver you will find work in more than 180 countries in the world. Scuba Cat Diving, PADI 5 Star CDC Center, Phuket, Thailand offers the most complete Scuba Diving all inclusive Career Internships in Thailand. We give the opportunity to our PADI IDC candidates to have a wide view of the dive industry. Scuba Diving is everywhere. 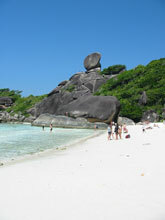 Our candidates get liveaboard experience in the Similan Islands or the Andaman Sea. Scuba Cat Diving was the first National Geographic Center in Phuket - another high dive center status offered through PADI. Scuba Cat also is an active Green Fins Member and has an active Reef Check team. Scuba Cat Diving, Phuket, Thailand can offer a range of Eco courses both PADI and Reef Check for all those interested in protecting the environment. Scuba Cat Diving, Phuket, Thailand is proud to have adopted a reef in the Similan Islands which is regularly checked from both of our liveaboard boats.